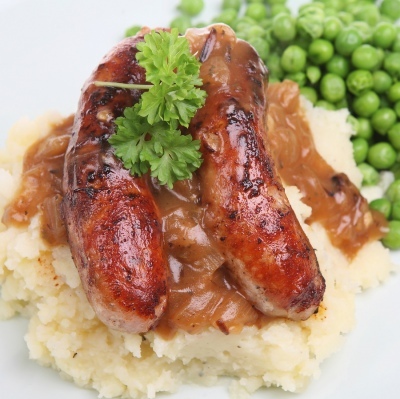 A delicious twist on the pork sausage. Fresh local farm sausages available in either a pack of 6 (pack weight 454g), a pack of 12 (pack weight 908g) or a large 2.5kg pack. Pork 70%, Water 11%, Rusk 10% (WHEAT Flour, Water,Salt, Raising Agent (E503ii), Honey 4%, Seasoning (Salt, Sugar, Stabiliser (E451i), Dextrose, Flavouring, Preservative (E221), WHEAT Flour, Antioxidant (E300), Spice Extracts, Sunflower Oil, Anti-Caking Agent (E551), Honey Powder), English MUSTARD. Allergens : See ingredients in BOLD. Contains Gluten from Wheat, contains Mustard.